On my own for the last three days of this desert road trip, I found myself camped in the Fry Mountains on the western edge of the 29 Palms Marine base in the Mojave Desert. Today's effort was a series of short hikes to a dozen summits around the perimeter of Lucerne Valley. All but one were on publicly accessible BLM lands, and the one on the marine base was but a short distance inside. The climbing was all standard class 2 desert except where noted. The first four summits were clustered in the middle part of this low, dispersed range separating Johnson Valley to the east from Lucerne and Fry Valleys to west. Peak 4,022ft lies just within the marine base. There are signs along the powerline road letting you know just where the boundary is. With an early start, I was able to reach the suumit in time for and a silhouette view of Peak 4,242ft, the last peak I had climbed the previous day. Less than half an hour was needed for the roundtrip ascent starting from the powerline road. A short distance along the road is the junction with a spur road heading north. This somewhat rough and sandy road gets one within half a mile of Peak 4,438ft on its east side. There is a motorcycle track going over the summit, providing ride-up opportunities for the more determined. The summit featured a Gordon/Barbara register from 1980. The only other entries were a handful of motorcyclists in 1989 and 1992. This summit lies a mile south of Peak 4,438ft and could well have been combined with it for a more interesting outing. Instead, I drove back out to the powerline road and approached Jean BM from the south at a distance of 2/3mi. The summit had an intact survey pole with the guy wires looking nearly as taut as the day they were installed in 1943. The benchmark was buried under the cairn built around the survey stick, but I found one of the nearby reference marks. Barbara & Gordon had left a register here in 1980 on the same day as the one on Peak 4,438ft. It had no one sign it until I showed up 39yrs later - always a fun find. About 2mi south of Jean BM, Peak 4,094ft is found on the south side of the powerline road in a Special Use area. The Marine base was expanded a few years ago in order to conduct larger exercises, but these are only scheduled for two 30-day periods during the year. At other times of the year it is open to the public as part of the Johnson Valley OHV area. I found a rough spur road that got me within half a mile of the summit on the north side. A very easy hike got me to the summit in less than 15min. I could probably have driven even closer but decided not to press my luck on the road as it grew increasingly more challenging past where I parked. This was the last of the Fry Mtns' 14 summits that I had to visit. A few more miles southwest on the powerline road leads to a junction with a decent (but badly washboarded) road heading northwest to an unnamed dry lake. Along the way, the road comes within a short distance of the peak on its NE side. It took a bit under 30min to make the 700-foot climb to the summit overlooking Lucerne Valley to the southwest, with the snowy San Bernardino Mtns as a backdrop. This was the most interesting peak of the day, with some modest class 3 scrambling and interesting granite formations reminiscent of Joshua Tree and the Coxcomb Mtns. I followed various roads to get within 2/3mi to the east of the summit. The area around the peak sees heavy motorcycle uses with tracks running all over the place. I used several of these to make the hike easier on the ascent and descent. There is a very large boulder, overhanging on all sides that one drives past. I paused to see if this could be climbed, finding it too difficult for me, but perhaps someone with more upper body strength could manage. There is another rather phallic rock found near where I started from, appearing to be far more difficult an ascent. It was so thin and featureless that even a rope over the top might not work, though a tall ladder certainly would. The easiest way to the summit of Peak 4,633ft is to stay on the east side where things can be kept to class 2. I wandered over to the west side thinking it might be easier, and it was here that I found the class 3 scrambling. Overall, a fun little peak isolated from the surrounding hills and mountains. Not knowing ahead of time just how close one can drive to the various summits, I thought I might be doing well to get through these first six summits on the day. As it was just barely past noon, I figured I'd keep going until I ran out of daylight, still many hours away. Found just east of Harrod Rd, before the road runs north through Tyler Valley and the Ord Mtns. A short hike up the steep east side leads to the summit in about half an hour. Lots of granite boulders at the summit, not quite as dense as the previous one, however. On the way back I found a small kids' ATV that had been abandoned, the battery, seat and a few other parts missing. Must have been too much trouble to haul the malfuntioning machine back home. This was the highest summit of the day. I continued north on Harrod Rd through Tyler Valley. The road deteriorates but continues north through a pass in the Ord Mtns. I stopped at the north end of Tyler Valley, parking off the road and heading up to the summit from the east side. There is a good view of Ord Mtn and Harrod Rd going over the pass to the northeast from the summit. I drove back south on Harrod Rd and then west at a junction. Peak 4,590ft is about 1.5mi west of Peak 4,835ft and the shortest route is from the north off a spur road. Nice view from the summit looking east to Peak 4,835ft & Peak 4,633ft. The next two summits are located in the SW corner of the Ord Mtns, a few miles east of paved SR247. A dirt road runs along the base of Peak 3,703ft on the east side for easy access. I nearly stepped on a large rattlesnake, about 18" in length that was curled up in the shade. It was getting chilly by this time so it had little energy. A first small rock did nothing to get it to budge, but a second got it slithering out of sight into the rocks - I wanted to lessen the chances of me encountering it a second time on my way down. 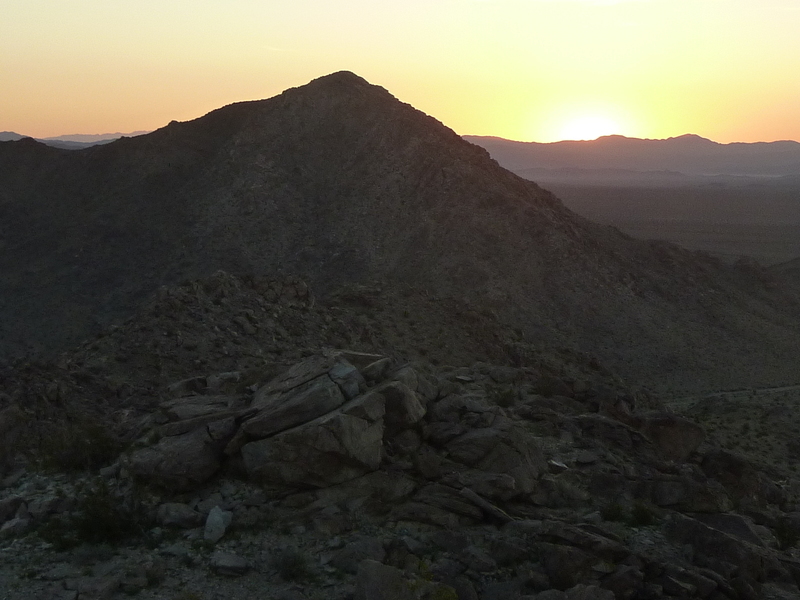 The peak has a central view overlooking the immense Lucerne Valley. A smaller neighbor to the south, this one is most easily ascended from the NE side, though any side would work. Dry Lucerne Lake and the scattered homesteads of Lucerne Valley can be seen to the southwest from the summit.